Greeks settled in the southern tip of the Italian Peninsula in the eighth and seventh centuries B.C. ; Etruscans, Romans, and others inhabited the central and northern mainland. The peninsula subsequently was unified under the Roman Republic. The neighboring islands also came under Roman control by the third century B.C. ; by the first century A.D., the Roman Empire effectively dominated the Mediterranean world. After the collapse of the Roman Empire in the West in the fifth century A.D., the peninsula and islands were subjected to a series of invasions, and political unity was lost. Italy became an oft-changing succession of small states, principalities, and kingdoms, which fought among themselves and were subject to ambitions of foreign powers. 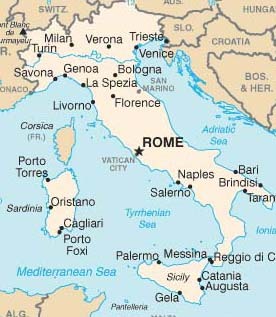 Popes of Rome ruled central Italy; rivalries between the popes and the Holy Roman Emperors, who claimed Italy as their domain, often made the peninsula a battleground. Italy allied with Germany and declared war on the United Kingdom and France in 1940. In 1941, Italy--with the other Axis powers, Germany and Japan--declared war on the United States and the Soviet Union. Following the Allied invasion of Sicily in 1943, the King dismissed Mussolini and appointed Marshal Pietro Badoglio as Premier. The Badoglio government declared war on Germany, which quickly occupied most of the country and freed Mussolini, who led a brief-lived regime in the north. An anti-fascist popular resistance movement grew during the last 2 years of the war, harassing German forces before they were driven out in April 1945. A 1946 plebiscite ended the monarchy, and a constituent assembly was elected to draw up plans for the republic. Under the 1947 peace treaty, minor adjustments were made in Italy's frontier with France, the eastern border area was transferred to Yugoslavia, and the area around the city of Trieste was designated a free territory. In 1954, the free territory, which had remained under the administration of U.S.-U.K. forces (Zone A, including the city of Trieste) and Yugoslav forces (Zone B), was divided between Italy and Yugoslavia, principally along the zonal boundary. This arrangement was made permanent by the Italian-Yugoslav Treaty of Osimo, ratified in 1977 (currently being discussed by Italy, Slovenia, and Croatia). Under the 1947 peace treaty, Italy also relinquished its overseas territories and certain Mediterranean islands. The Italian state is centralized. The prefect of each of the provinces is appointed by and answerable to the central government. In addition to the provinces, the constitution provides for 20 regions with limited governing powers. Five regions--Sardinia, Sicily, Trentino-Alto Adige, Valle d'Aosta, and Friuli-Venezia Giulia--function with special autonomy statutes. The other 15 regions were established in 1970 and vote for regional "councils." The establishment of regional governments throughout Italy has brought some decentralization to the national governmental machinery, and recent governments have devolved further powers to the regions. However, many regional governments, particularly in the north of Italy, are seeking additional powers. The 1948 constitution established a bicameral parliament (Chamber of Deputies and Senate), a separate judiciary, and an executive branch composed of a Council of Ministers (cabinet), headed by the president of the council (prime minister). The president of the republic is elected for 7 years by the parliament sitting jointly with a small number of regional delegates. The president nominates the prime minister, who chooses the other ministers. The Council of Ministers--in practice composed mostly of members of parliament--must retain the confidence of both houses. The U.S.-Italian bilateral economic relationship is strong and growing. The United States and Italy cooperate closely on major economic issues, including within the G-8. With a large population and a high per capita income, Italy is one of the United States' most important trade partners. In 2002 the United States was the fifth-largest foreign supplier of the Italian market and the largest supplier outside the European Union. Total trade between the United States and Italy was $34.4 billion in 2002. The U.S. ran a $14.2 billion deficit with Italy in 2002. Significant changes are occurring in the composition of this trade. More value-added products such as office machinery and aircraft are becoming the principal U.S. exports to Italy. The change reveals the growing sophistication of the Italian market, and bilateral trade should expand further. In 2002 the United States imported about $24.3 billion in Italian goods while exporting about $10.1 billion in U.S. goods to Italy. U.S. foreign direct investment in Italy at the end of 2001 exceeded $23.9 billion. Italy's agriculture is typical of the division between the agricultures of the northern and southern countries of the European Union. The northern part of Italy produces primarily grains, sugarbeets, soybeans, meat, and dairy products, while the south specializes in producing fruits, vegetables, olive oil, wine, and durum wheat. Even though much of its mountainous terrain is unsuitable for farming, Italy has a large work force (1.4 million) employed in farming. Most farms are small, with the average farm only seven hectares. For further economic and commercial information, please refer to the Country Commercial Guide for Italy. Italy was a founding member of the European Community--now the European Union (EU). Italy was admitted to the United Nations in 1955 and is a member and strong supporter of the North Atlantic Treaty Organization (NATO), the Organization for Economic Cooperation and Development (OECD), the General Agreement on Tariffs and Trade/World Trade Organization (GATT/WTO), the Organization for Security and Cooperation in Europe (OSCE), and the Council of Europe. It chaired the CSCE (the forerunner of the OSCE) in 1994, the EU in 1996, and the G-8 in 2001 and served as EU president from July to December 2003. Italy firmly supports the United Nations and its international security activities. Italy actively participated in and deployed troops in support of UN peacekeeping missions in Somalia, Mozambique, and East Timor and provides critical support for NATO and UN operations in Bosnia, Kosovo, and Albania. Italy deployed 1,000 Alpini troops to Afghanistan in support of Operation Enduring Freedom (OEF) in February 2003. Italy also supports international efforts to reconstruct and stabilize Iraq through its military contingent of some 2,800 troops, as well as humanitarian workers and other officials. The troops remain in Iraq under UN mandate and at the request of the sovereign Iraqi Government. The Italian Government seeks to obtain consensus with other European countries on various defense and security issues within the EU as well as NATO. European integration and the development of common defense and security policies will continue to be of primary interest to Italy. The United States enjoys warm and friendly relations with Italy. Italy is a leading partner in the war against terrorism. The two are NATO allies and cooperate in the United Nations, in various regional organizations, and bilaterally for peace, prosperity, and security. Italy has worked closely with the United States and others on such issues as NATO and UN operations as well as with assistance to Russia and the New Independent States; the Middle East peace process; multilateral talks; Somalia and Mozambique peacekeeping; and combating drug trafficking, trafficking in women and children, and terrorism. Under longstanding bilateral agreements flowing from NATO membership, Italy hosts important U.S. military forces at Vicenza and Livorno (army); Aviano (air force); and Sigonella, Gaeta, and Naples--home port for the U.S. Navy Sixth Fleet. The United States has about 16,000 military personnel stationed in Italy. Italy hosts the NATO War College in Rome. Italy remains a strong and active transatlantic partner which, along with the United States, has sought to foster democratic ideals and international cooperation in areas of strife and civil conflict. Toward this end, the Italian Government has cooperated with the United States in the formulation of defense, security, and peacekeeping policies. The U.S. Embassy in Italy is located at Via Veneto 119, Rome (tel. (39)(06) 46741. Schengen Visa Info -- which contains detailed and very accurate information about Italy VISA. What's more, the website is also translated in 5 different languages and also gives free and very updated info for visa requirements and documents needed for those who are trying to go into Italy and need visa.